After nine months in Australia and three weeks in New Zealand, it was time to venture out of the first world for the first time. We hit up Bangkok and Koh Chang in Thailand before heading off to Cambodia to see Koh Kong, Koh Rong and Sihanoukville. It was a ‘VIP’ minibus that picked us up from Otres Beach 2 in Sihanoukville and took us through rain northwards to a sunny Phnom Penh, the capital of Cambodia. It was no modern shiny concreted Bangkok on first impression, more like a bigger hustlier-bustlier version of Sihanoukville with even more motorbikes and ubiquitous signs for the ‘Cambodian People’s Party’. The government is seemingly pretty corrupt and the country does well through tourism and so on despite the ruling CPP, rather than because of them. Still, capitalism is clearly helping the country in many ways and many of its issues are to be found across first world countries the world over. We changed buses at Phnom Penh and headed up to Siem Reap. It was a long journey – a 12 hour trip in all, plus a short tuk-tuk journey at the end. The driver was desperate for us to book him to take us to the temples the next day as he didn’t get any of the $3 we paid his company for him to take us to our hostel. We had BBQ food at a restaurant that served amongst its delicacies: ‘frog’, ‘eel’, ‘intestines’ and ‘insides stuff’. That’s a direct quote from the menu. Being an open minded fearless adventurer I plumped for none of those and stuck with chicken. Somehow I ended up having one of the hottest meals I have ever had. Perhaps they threw in extra chillies to punish me for not braving the local speciality of barbecued intestines. Thank goodness they did ice cream for dessert. Interestingly, whereas in Thailand the only currency used is Thai Baht, in Cambodia you use US$ unless it’s under $5, in which case Cambodian Riel is used. There are no coins in Cambodia! Next time: the Temples of Angkor! 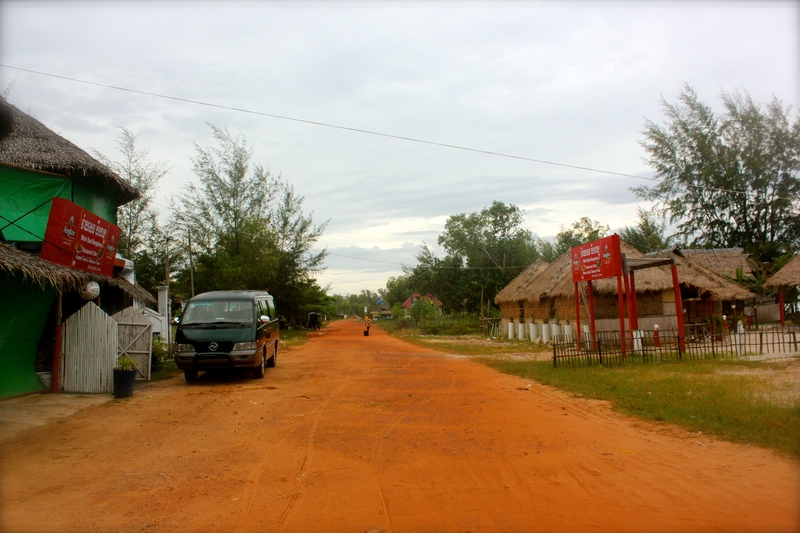 This entry was posted in South-East Asia, Travel and tagged Cambodia, Siem Reap, South East Asia, Travel Stories. Bookmark the permalink.